Editor’s Note: Do you have information on this ship’s role at the Siege of Petersburg? Please contact us using the Contact button in the menu at the top of the screen. We are happy to exchange information with other researchers. Namesake: The third letter in the Greek alphabet. Gamma was built in 1863 as steamer R. F. Loper at Philadelphia, Pa.; purchased there 3 June 1864; renamed Gamma, but was also called Tug Number 3 and Picket Boat Number 3. 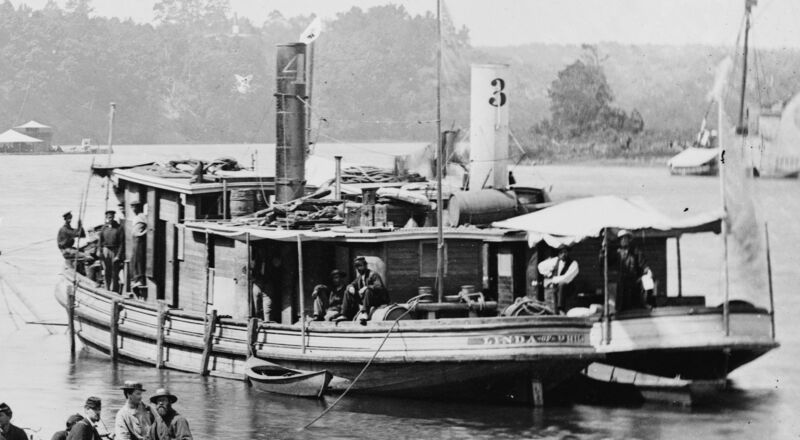 Gamma was assigned as a picket boat in the James River, Ens. Henry F. Curtis in command. She arrived at New Bern, N.C., from the James River 3 April 1865. Placed at the disposal of General W. T. Sherman’s quartermaster, she served in the sounds of North Carolina until close of the Civil War. She was sold by public auction at New York 25 October 1865 to D. Trundy. Redocumented as merchant steamer Peter Smith 13 December 1865, she burned at New York 9 May 1893.